The TUDOR United SportsCar Championship made its formal debut this weekend at Mazda Raceway, the first race in Monterey since the ALMS and Grand-Am fields were formally joined. ESM Racing made it another first, becoming the series’ first LMP2 race winner, and reassuring (at least momentarily) those who questioned IMSA’s ability to balance Daytona Prototypes and ACO-based LMP2s. More pictures to follow, but the photo above is the end result of an incident between the Porsche 911 of Nick Tandy and the BMW Z4GTE of RLL Racing’s Bill Auberlen. Auberlen and Tandy made contact coming out of turn 11 and again on the last lap, leading IMSA to assess a penalty on Tandy’s car and demoting it to ninth place in GTLM. 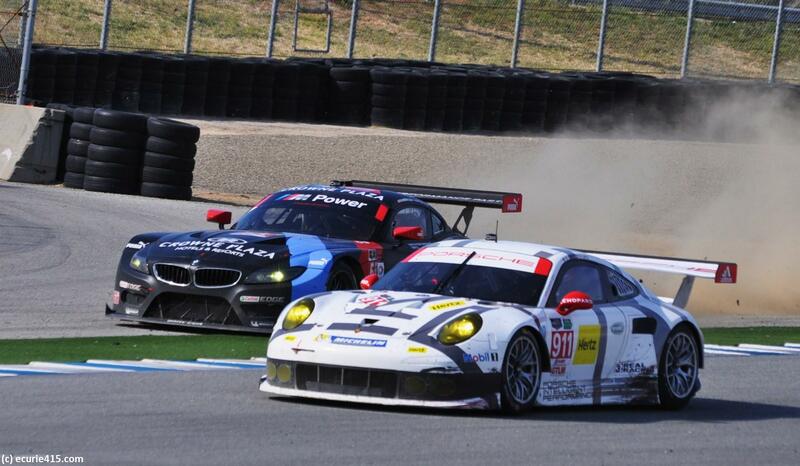 Was the contact worth a penalty, or was it a case of hard racing in the waning laps of a race? This entry was tagged Bill Auberlen, BMW, IMSA, Laguna Seca, Mazda Raceway, Nick Tandy, Porsche, Tudor United SportsCar Championship. Bookmark the permalink.